The island of Koh Chang has a beautiful and untouched nature. There is a huge jungle in the middle of the island and most of it belongs to the national park so it’s really pure nature. Also there is a little mountain (744m) which makes a trekking tour a nice adventure. As there are no signposted paths, the inner of the island is huge and there can be monkeys and snakes we were recommended not to go by ourselves so we booked a tour instead. Recommended was Tan Trekking a company with over 10 years of experience for Trekking on Koh Chang. But I heard and am pretty sure the other companies are doing similar tours and routes and are not worse than Tan as my experience was not the best! Links and info at the end of the site. As the tours are not offered daily we booked a tour on the next day which was the “Klong Prao Trek“. The guide Tan himself picked us up on time at our hostel in Lonely Beach about 8.00am. After picking up some other participants we drove to Klong Prao to a path where the elephant camp is in the middle of island. After getting out the guide didn’t even introduce himself properly. Also they said to us the trek is limited to 10 people as it does not make sense to be more. Well we were 22 people! After asking why, the guide just told us well sometimes it’s a bit more, therefore we are 2 guides today. We got water which was supposed to be unlimited, but in fact it was 2 liter for everyone. Which is really not enough, I was really glad I had one more liter with me, but even that was not enough. When you are trekking in the jungle for a full day and having this humidity you need a lot of water. So be sure to take more water! We also got our lunch and the trekking pole. Then off we were. Which meant the guide was just going ahead in the middle of the island. He was not telling much about the island/nature and even if, he didn’t stop and it could just be heard from the first 5 of the 22 people. Very disappointing. He was more like a walker, not a guide. As there were families and children with us and the climb up to the hill was hard, the group slowly split in two parts. There was one group with about 10 more fit people including us and a second group with 12 a bit older people or kids. Tan didn’t even care about, that he was running in the front. After reminding him we are losing people because he didn’t mentioned, he stopped until they arrived and then he started running again. I had never seen something like that, it was awful. Good thing was the people in our group were really nice and also the nature was really nice. The shade of the jungle made it beautiful to walk there. Also the path itself was nice and the rise to the top of the mountain was challenging. After 2 hours of walking we arrived at a nice viewpoint close to the top. As the other group was far behind Tan finally gave a little bit of information about some things. When the rest arrived we had the make a decision to go on the highest Top or stay here. Of course we did go but there were quite some people that didn’t. The way up was very steep and not to easy, but we all made it and good 20 minutes later we were on the top and had the best view on the west part of the island. What a great view! After getting back to the others we walked down a little bit to get to a little creek/river. Here we did eat our lunch. Some rice with vegetables and chicken. I also would recommend to bring some more food to survive the day properly. We now could take a path to a nice tier with a pool of a waterfall or stay at the creek. Of course we also did go. We had a dip in the pool which was actually very nice. But we had just 10 minutes time there and needed to go back as the others were waiting. From there it was just going down slowly back to the beginning. Same procedure as before Tan was running in the front telling nothing important. We walking behind him and had our fun. Every 20 minutes we stopped waited for the others and then continued. Unfortunately we didn’t see any interesting animals (monkeys, deer, snakes etc.) but the nature was still impressive. From starting to being back at the base it was 6 hours. So even with transportation and instruction it was not close to 8 hours. We gave back our things and were brought back to our hostel in Lonely Beach. As you can imagine I cannot recommend that company in any way. Maybe it was just a bad day and usually it’s really restricted to 10 people which would make sense but in our case it wasn’t. Tan is a really nice guy, but not a good guide. Surely he knows the island and his way perfectly. But he didn’t say any interesting things about the nature/island or else. He didn’t care about the group and even complained about the slower ones at one point. All in all I have no idea where the good reviews and recommendations come from. Or maybe he really just had a bad day. Taking 22 instead of 10, giving the cheapest water and lunch and not unlimited and running to the path to for sure be done in less than 8 hours. Well I still liked doing it. The path was great, the other people were nice, climbing up the mountain was challenging and the view from the top was great and the waterfall was nice as well. So all in all I would recommend doing a trekking tour on Koh Chang and seeing something complete different instead of the beaches. Just don’t expect too much from your guide or choose another company! 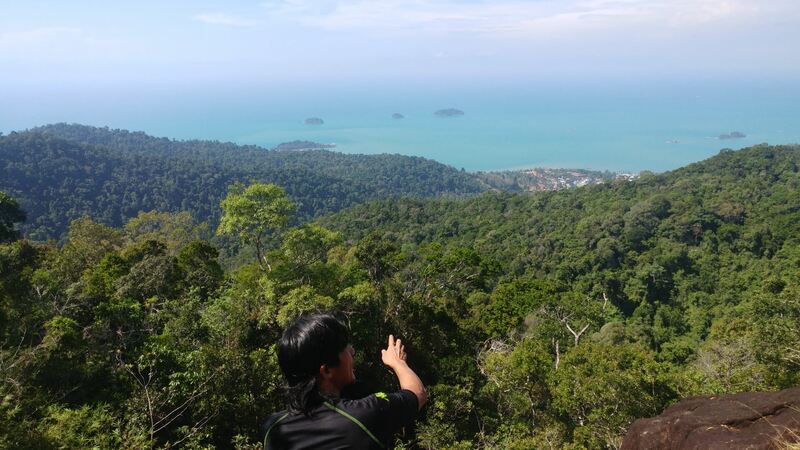 Here is an overview of the guides that offer trekking tours on Koh Chang. You can also go to any tourist info at Lonely Beach and ask about the tours. Be sure to ask which company the tour is from and check their website and reviews before booking!